Become an Email Signature Rescue Affiliate. Ideal for Agencies, Designers, Developers & Marketers. Already a member? Login to your Dashboard now and follow the instructions below. Not a member yet? You'll need to join first, then follow the instructions below. As a valued Affiliate, you'll receive a 40% commission of any first sale you send our way, paid out to your Paypal account, 30 days after the sale, as long as your referral hasn't cancelled or refunded their plan. Payments are always calculated and paid in USD, regardless of which currency the referral signed up with. Can I be a Reseller and an Affiliate? Yes. However, if you are part of our Reseller Program and have been issued a discount code, you cannot use both your Affiliate Link and your discount code together. You will not be paid a commission on any sales that use a Reseller Discount code. From time to time, we may run promotions through our Affiliate network that allow discount codes, you will need to check your Affiliate Dashboard to be informed of these promotions. What's the difference between a Reseller and an Affiliate? Resellers generally use their own credit card to sign up clients and create email signatures on their behalf. They send the HTML email signatures to their own clients and generally their clients do not need to know that they used us at all. Resellers issue a yearly invoice to their clients for creating and managing the email signatures, which could be any amount they would like to charge. Resellers get a discount code issued to them which entitles them to 20% off any plan for life. Affiliates generally provide their clients, friends and family with their affiliate link and then their clients visit our website using that link and we track if that client purchased a plan. We then pay out a 40% commission on the initial sale to the Affiliate, 30 days after the sale, as long as that client hasn't cancelled or refunded their plan in the mean time. 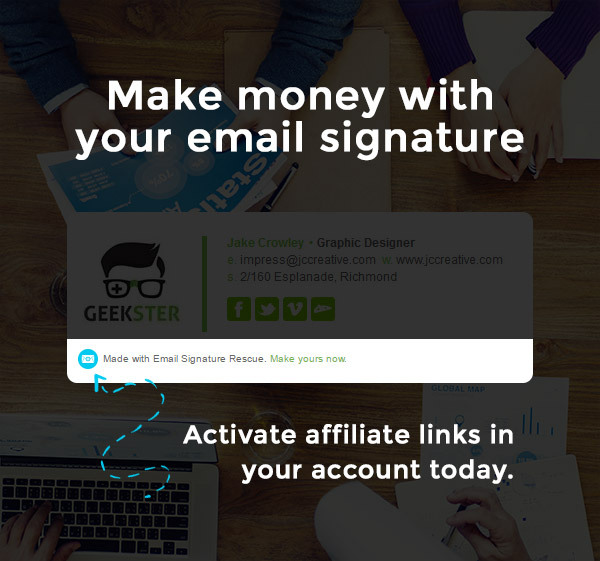 Activate your affiliate link in your email signature and start making money!